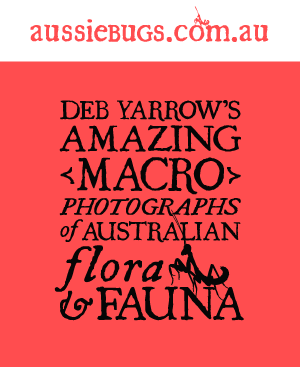 Deb Yarrow, Macro Photographer from Brisbane, Queensland, Australia. Insects. Annoying, biting, germ-carrying, cake-ruining! As an Aussie growing up in the bush the omnipresent insect is a fact of life. Common, every day things. We don't give them a second thought, other than our efforts to not let them ruin our BBQ's: don't let the ants get at the bread rolls; and who's got the Aeroguard, these mozzies are driving me nuts! Spiders are worse - the famous redback making us check under toilet seats for a lifetime, even though few of us actually know someone who's been bitten by one, on the bum or otherwise. Which is just as well by all accounts. So why take photos of the creepy crawlies? Because I can! They're right here, literally in my backyard and everywhere in this great country I go. The first insect I photographed macro style was a wasp. I was amazed by the detail I'd never imagined was there but of course it had to be there, it'd just gone unnoticed by me. I knew that it was a wasp and it has a mighty sting, but that was the extent of my knowledge. The other thing I didn't expect but have come to love about macro photography is how relaxing it can be. By the very nature of the practice, photographing living insects requires patience and sort of a meditative state. Standing in my garden in the late afternoon, sometimes just observing bugs going about their business, watching the butterflies, thinking about the nature of things, brings about a deep peace of mind and tranquility that I've come to depend upon. Now I'm still constantly surprised by the creatures I come across and the learning that comes with it, when my curiosity gets the better of me and I end up googling and then boring all my (long-suffering) loved ones with my discoveries! I hope they, like me, appreciate someone who's passionate about what they do. P.S. You might also be wondering why I would be so arrogant as to call my own photos amazing. it's not that I am very pleased with my photography skills (which I am! ), if you strip away all the pretty composition and lighting, I still find them simply amazing to look at and hope you do too. Thanks to my awesome dev team, the wonderful Grant Walker, whose encouragement and support keeps my bug photos going.